Welcome to Nicholas' pet portraits oil painting of Artu. We love working with returning clients and Gill Austin has commissioned us previously so it was wonderful to work with her again. Although new clients are commissioning all of the time, our returning clients do make up quite a proportion of our commissions each year. We are thrilled as it means that we are running our business correctly! Artu's painting was completed by Nicholas Beall in oils on canvas and you can read more about it below. We would love it if you would also share our page too! Returning client Gill Baxter emailed to ask if we would be able to have a portrait painted and sent to them for her daughters 18th birthday. We were delighted and we sent Gill off with the task of taking photos of Art when her daughter Bella, was at school so no surprises were ruined. 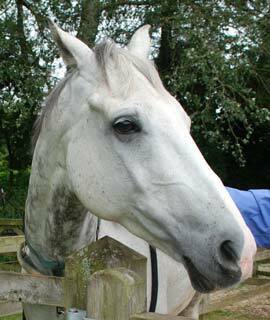 Gill took a variety of photos, some with Artu in a head collar however she wanted Artu depicted without any tack. She Gill had another go at taking photos without the collar and she managed to come up with quite a few for us to choose from. Gill wasn’t able to manage to get Artu's ears to look forward, however Gill had taken lots of other photos of Artu's ears in that position so Nicholas was able to use them for the painting form another photo. Got it! Everyone happy! Thank you, it looks great. We often take photos near the end stage of the oil portraits so that clients and viewers of our website can see them in more detail. you don’t always see them this closely when they are displayed on the wall as normally paintings or drawings displayed on the wall are viewed from a few feet away. 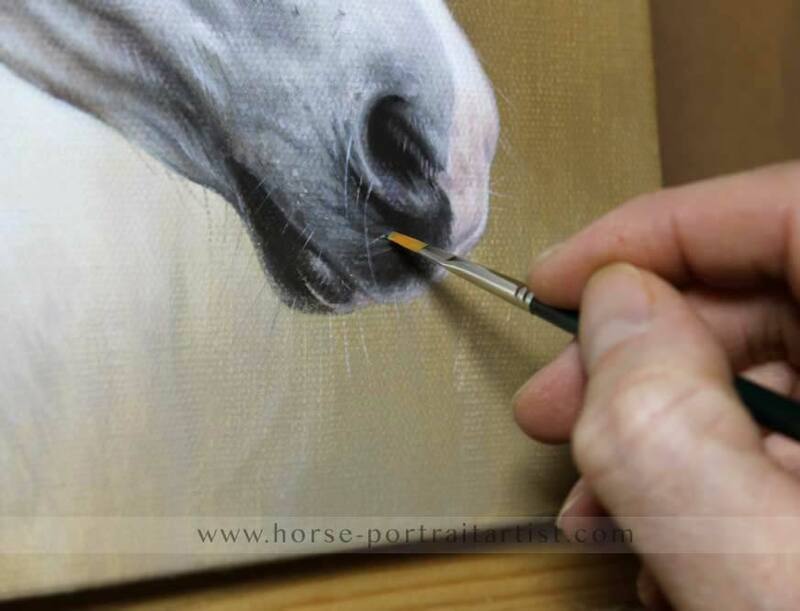 However we always like to show exactly how much detail and fine painting goes into each oil painting. The two photos below shows Artu up close with Nicholas' hand and brush to help viewers judge scale. We hope that you have enjoyed viewing Artu's oil painting along with the close up detailed photos too. 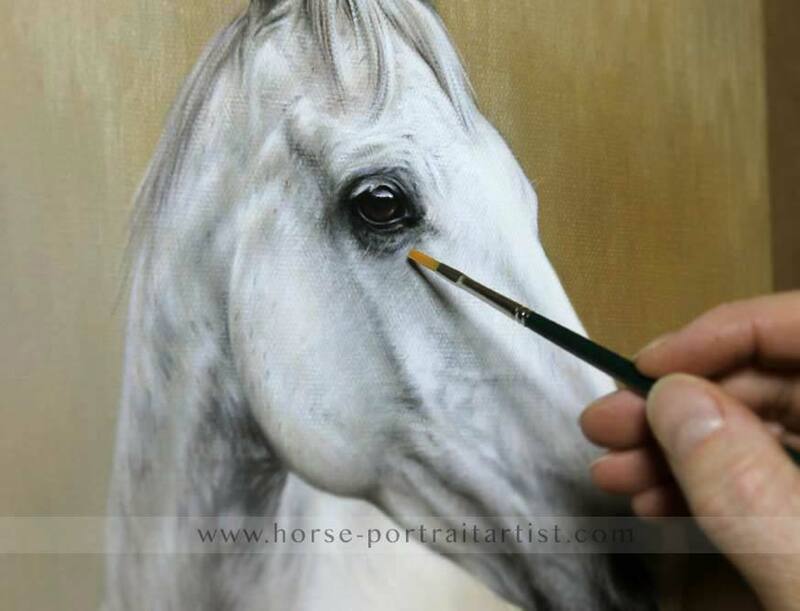 If you are considering commissioning a horse portrait as a birthday surprise, email us as soon as possible. Let us know the size of portrait you are thinking of having, if you would like it framed by our framer, along with photos of your horse too. 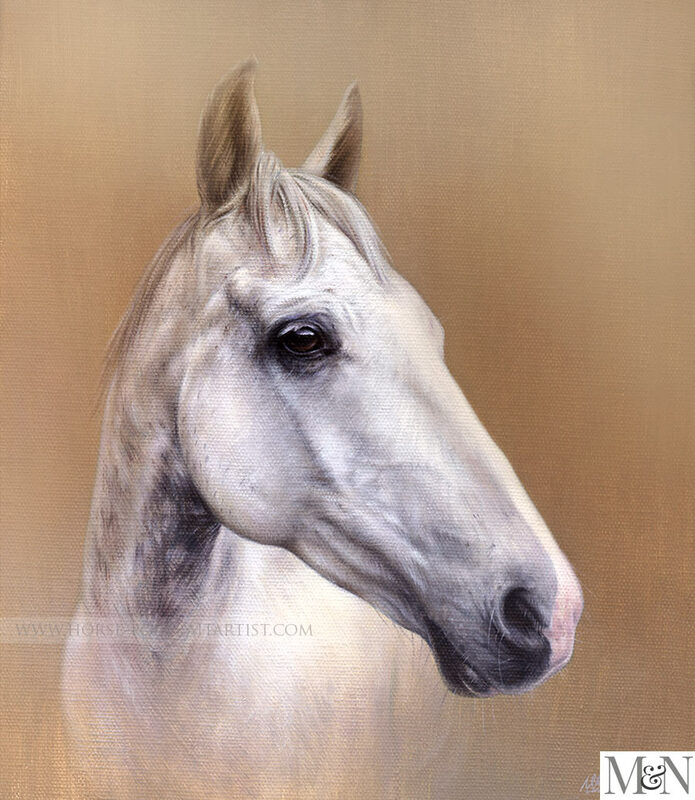 Contact us at any time via our Horse Portraits Contact page.